In northern Tunisia, between the mountains and the Algerian border, lies the small town of Bargou. Situated in one of Tunisia’s poorest areas, it is home to an authentic musical heritage known as salhi. Rhythms and instrumentation – frame-drums, guembri, endblown flutes – link it to Berber music, but Bargou’s rural isolation has ensured the growth of a home-grown style, albeit one with no original recordings. 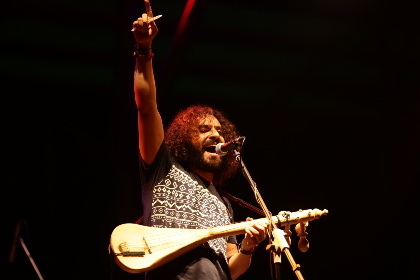 Singer Nidhal Yahyaoui was born in Bargou and has taken on the cause of reviving the repertoire of this endangered musical culture. 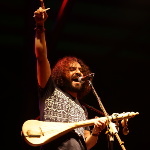 With producer Sofyann Ben Youssef, he set up a mobile studio in his family’s home and began rehearsing and recording with local musicians and some international invitées. Enhanced with Sofyann’s empathetic electronic sounds the result is a respectful and powerfully compelling modern invocation of a timeless tradition. Electro-Trad!